You can improve a lot of things about your energy consumption by following a few rules of thumb, but at one point or another you’ll need to measure your use to know where to place your efforts. Your utility bill is a great tool, and it gives you a high-level overview of trends, but it won’t help you change your behavior in real-time, pinpoint problem areas, or dispel assumptions. By tracking things better you can also decide where it may be worth it to install some smart control (a timed switch or outlet, a presence sensor, etc), or if upgrading an appliance is worth it energetically. In this post I will share some some of the approaches to measurement I’ve taken for electricity use. Kill-a-watt EZ for appliance and outlet-level analysis. The TED 5000 (http://www.theenergydetective.com/)is a small simple device that installs in your main electricity junction box and measures current and voltage in real-time. This allows it to compute power used and keep track of it over time. You install the measurement unit (which they call “MTU”) in the junction box, and then it sends out the measured data to a box plugged elsewhere in the house which is called a “Gateway”. This gateway has a network cable interface and you can plug it into your ethernet. The Gateway exposes a web page which you can see in your browser, which shows real-time and aggregate information. Real-time checking of how much appliances are using when they are on or an average over time. Seeing how my hourly & weekly electricity usage patterns can be changed. Getting really annoyed at appliances that I can’t turn off e.g. refrigerator. An appliance-by-appliance analysis of my usage, because of the way it measures and tracks electricity, and also because it’s appliance “Load Profile” scheme seems to mix up my house appliances a lot. Everyday behavior adjustment based on usage and projections – I am finding external apps are more likely to do this for me. The information can be seen in a bunch of mobile apps which connect directly to your TED 5000 Gateway, amongst which Mirawatt T5K (http://ted.mirawatt.com/)is the one I liked the most (I use an iPhone, there are similar apps for Android and possibly Windows Phones). 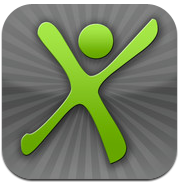 It is only worth the $4.99 price because it has no competition as far as user experience goes. (It is not spectacular, however. It is just the least bad of the bunch). Others I didn’t like as much were TED-O-Meter or iTED. These are free, so yay & kudos for the efforts to those developers. To access the information outside your home via your mobile network you will need to configure your internet router to expose the TED Gateway IP address directly on the internet. PeoplePower (http://peoplepowerco.com/)is a relatively new effort that provides an internet service and a mobile app to access your data. The TED 5000 Gateway stores some usage data, but PeoplePower promises to save your data for a longer time on a real server and its mobile app has more features around projecting and setting goals for your electricity use. It’s headed in a promising direction, and they are also making some steps in gameifying environmental behaviors. You configure the service by telling your TED device to “post” data to their website. Just follow the instructions you get when you sign up. If you run into any issues or the TED configuration is acting up on you, just email them- I can attest their technical support is excellent. The Kill-A-Watt EZ is a great little device. 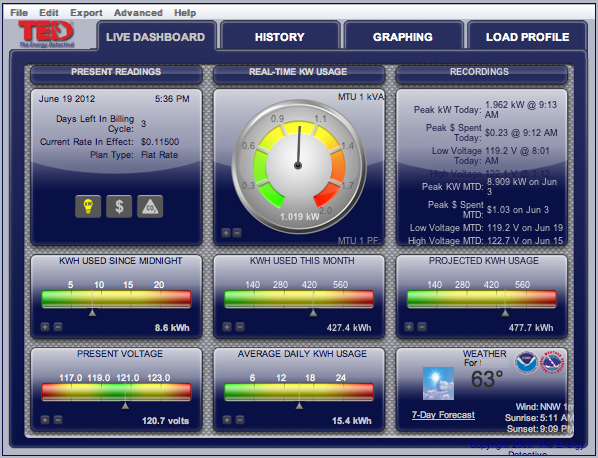 It tracks the energy usage over time and displays real-time or accumulated information. It can show Watts, KWH, or $ (you have too tell it your electricity rates). Keeping ongoing track of devices that have “spikes” of use. For example, knowing how many watts my microwave oven uses when it’s on is less interesting than knowing how much energy I am using in it over a month. Measuring specific outlets I want to track for other purposes like the charger outlet to the battery of my car, which runs off a standard 120V outlet. I want to track if my battery recharging becomes less efficient over time, and have concrete data for EV naysayers who say it uses more electricity than it’s worth it in gas. I have tried other devices like the “Belkin Conserve Insight Energy-Use monitor”. It has a nicer physical design but it’s almost a waste of money when it comes to measurements, because of the way Belkin chose to aggregate and display the data. I’ll stick with the Kill-a-watt. I have a couple of Kill-A-Watt unit (one fixed for the car charger and one that ‘roams’ around the house as I make week-long measurements). The next obvious evolution is to have these meters transmit data via wireless to services such as PeoplePower’s. I’m sure an enterprising soul with a Kill-A-Watt, some micro controller knowledge or a new ElectricImp and time to invest in a cool project could take the output of the former and beam it via wireless provided by the latter. Sounds worthy of a Maker Faire project. Note that none of the above help measure electricity used by built-in lamps or lighting systems that you turn on and off via a wall switch (unless you wire things yourself). Maybe one day soon light switches and outlets that automatically measure, store , and forward usage patterns will become economically viable. Some smart digesting of the ensuing data deluge could provide actionable and personalized tips to do more with less. This entry was posted on Wednesday, June 20th, 2012 at 12:20	and tagged with Apps, Energy consumption, environment, Kill A Watt, Smart meter, technology, TED, Testing and posted in Electricity, Measure. You can follow any responses to this entry through the RSS 2.0 feed.